Keshavarz, M., Amro, M. (2019). Attitude of Muslim Students towards English Idioms and Proverbs. International Journal of Society, Culture & Language, 7(1), 40-51. Mohammad Hossein Keshavarz; Majed Amro. "Attitude of Muslim Students towards English Idioms and Proverbs". 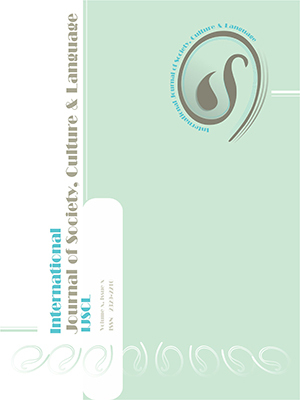 International Journal of Society, Culture & Language, 7, 1, 2019, 40-51. Keshavarz, M., Amro, M. (2019). 'Attitude of Muslim Students towards English Idioms and Proverbs', International Journal of Society, Culture & Language, 7(1), pp. 40-51. Keshavarz, M., Amro, M. Attitude of Muslim Students towards English Idioms and Proverbs. International Journal of Society, Culture & Language, 2019; 7(1): 40-51. This study aimed at investigating the attitude of Muslim students towards the use of certain English idioms and proverbs. Thirty Muslim students were asked to express their reactions and feelings towards two categories of English idioms and proverbs: the first category included idioms and proverbs containing the names of animals that are prohibited in Islam, and the second category contained culturally inappropriate idioms and proverbs. The results of data analysis revealed that idioms and proverbs belonging to the first group were found by the majority of the participants to be rather offensive, while culturally inappropriate idioms and proverbs were less offensive. This indicates that religion is the main influential factor in the reaction of Muslim students towards English idioms. Non-Muslim English teachers may find the results of this study useful in gaining awareness about the attitudes of Muslim students towards the use of religiously and culturally-loaded idioms and proverbs and taking precautions in using such idioms in the classroom environment.